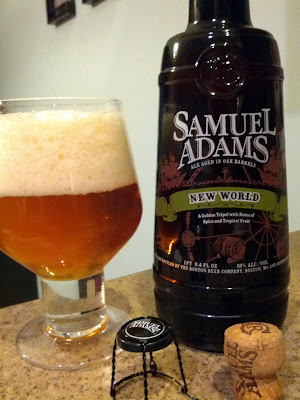 Another Belgian tripel from the folks at Sam Adams. The brewers took a couple interesting twists with this by dry hopping it with Saaz hops then they mix in their Kosmic Mother Funk. The Kosmic Mother Funk, besides now being on my must try list, is an oak aged Belgian ale. Let’s see how the New World compares to all the other Belgian Tripel’s out there. Holy fracking crap, the cork rocketed off the bottle after applying just a minimal amount of pressure. I didn’t even realize what happened til I heard it slam into the ceiling and the dog barking at it. This is likely due to the fermentation that occurs in the bottle, but I’ve never had such an explosive bottle opening before! It pours a great golden amber color. There is a tremendous amount of cream colored fluffy head that goes down rather quick but lingers a bit on the side of the glass here or there. It’s not cloudy at all but there is a serious stream of carbonation. There are some candy sweet smells mixed in with a bit of the standard Belgian fruity aroma. My tongue is presented with very complex sweetness here, its an awesome combination of candy and fruit. The mouth feel is very light but tremendously bubbly and carbonated. This is a different twist to the Belgian Tripel, and it’s a positive twist I’d love to try again. I’m happy to give this a solid 4/5 rating. All of the above was based on the first glass, the second glass did not fare as well. The sweetness became over powering and made my lips pucker a bit. I’m not gonna let that lower my rating though, I just want people to be aware.